The BJP may attempt to abrogate Article 370, at long last removing Kashmir’s autonomy. The controversial statement has created a stir. Questions are being raised about the government’s motives and the timing of this controversy. One also needs to understand why the Hindu right-wing party, Bharatiya Janata Party (BJP), wants this article gone. 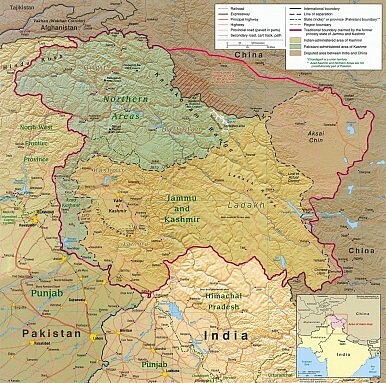 Article 370 owes its birth to the unusual circumstances under which Jammu and Kashmir joined India in the late 1940s. The Hindu king of Kashmir, Hari Singh, refused to merge the state either with India or Pakistan after partition. He wanted to retain sovereignty, unlike the majority of the 500-plus princely states who decided to go either with India or Pakistan after partition. The Islamic Republic wanted to have claim over Kashmir on the ground that it was a Muslim majority state, thereby justifying the two nation theory. However, the popular political movement under the leadership of Sheikh Abdullah was dead opposed to any merger with its western neighbor. Instead, Abdullah favored merging with secular and democratic India. Amidst all these claims and counterclaims, tribes from Pakistan’s North West Frontier Province (NWFP) raided Kashmir in October 1947 and the Hindu king, taken aback by this sudden aggression from across the border, approached New Delhi for help. An Instrument of Accession was signed between Kashmir and India on the condition that the state would enjoy a “special status” and it was understood that the agreement would in no way affect the sovereignty of the state’s princely status. New Delhi accepted the terms and conditions and Article 370 was added to the Constitution, giving Kashmir a special status. With the exception of defense, foreign affairs, and other matters specified in Instrument of Accession, India’s Parliament will have to ask the permission of the state legislative assembly to apply other laws. All political parties accepted the special clause for Kashmir in the Constituent Assembly in 1947. The significance of the accession lies in the fact that a Muslim majority state refused to merge with Pakistan. The leader of National Conference, Sheikh Abdullah, who had been leading a popular movement against the king and advocating the merger of the state with secular India, refused to buy into the two nation theory propounded by Mohammad Ali Jinnah, the founder of Pakistan. Long before the partition took place in 1947, Abdullah had distanced himself from Jinnah’s idea of an Islamic state and reaffirmed his faith in the leadership of Mahatma Gandhi and Jawaharlal Nehru, both of whom advocated a democratic and secular India. India’s new Hindu right-wing government has several reasons to want to abrogate Article 370. The primary reason lies in the political narrative that evolved after the signing of the Instrument of Accession. Sheikh Abdullah became the Prime Minister of Jammu and Kashmir and he introduced land reforms and some other measures that affected the landed Hindu community and favored the Muslim majority who had been mostly marginalized under the Hindu kingdom despite their numbers. In addition to the policy problems in Kashmir, the Indian government has also been not honest in implementing the provisions of the article. The union government over the last six decades has slowly been diluting the provisions of Article 370. It has largely left behind the commitment made at the time of Accession. On the other hand, Hindu right-wing activists have been conducting a parallel campaign for the abrogation of the article. This double assault has had adverse effects: it has been alienating Kashmir’s Muslim majority and fueling separatist tendencies in a state which was once overwhelmingly in favor of merging with India. The abrogation of Article 370 is one of the prominent agendas of the Hindu right to expand its majoritarian agenda all over the country. With the BJP gaining an absolute majority in the parliament in the recently conducted elections, fears in the Kashmir valley have risen. The statement by the minister has further accentuated this skepticism. Analysts say that abrogation of the Article would not serve the larger purpose of India and would dent the country’s secular and pluralistic character. “It is time to recuperate and refurbish the covenant of the federative promise and principle, setting a uniquely outstanding example both in terms of plurality of citizenship and of political participation in opposition to totalitarian impulses,” opines Raina. Article 370 is the bridge that connects India with Kashmir. Any attempt to annul the all-important constitutional provision would mean cutting the umbilical cord that connects pluralistic India with the only Muslim majority state in the nation. At a time when the situation in the Kashmir valley is precarious, the attempt should be to assuage the frayed tempers and win back the trust of the population who six decades ago hooked their destiny with secular India. New Delhi should try to win back that trust rather than scrap the very instrument which connects the valley with the heartland. The argument that the article separates New Delhi from Srinagar is tendentious. On the contrary, the Article is the basis of a strong link between the two parts of India. India voted for the BJP to strengthen the core values that define the idea of India. Tampering with Article 370 would mean an assault on that syncretic tradition. It would entail not only a betrayal of the mandate, but also an abuse of history. It would legitimize fears in India that the BJP has an agenda to turn this culturally diverse nation into a majoritarian state. The Kashmir Question: What Next? Narendra Modi has re-ignited an exhausted debate: What should be done about Kashmir? Jammu and Kashmir Comes Under Direct Rule as Ruling Coalition Falls ApartDiscontent in Kashmir: The PDP-BJP Alliance’s MistakesWhat is the BJP's Ladakh Strategy?During Kashmir Visit, Modi Slams Pakistan's 'Proxy War'Indian Elections 2019: Do Narendra Modi and the BJP Deserve a Second Term?